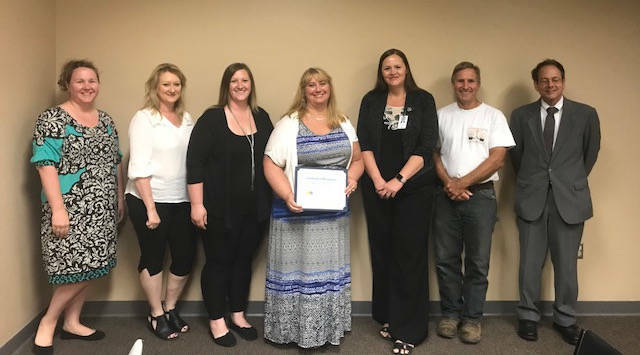 The Highland County Drug Abuse Prevention Coalition was recently recognized by PreventionFIRST, a Cincinnati nonprofit, for exceptional effort in curbing drug abuse in the area. Shown from left with a certificate of recognition from PreventionFIRST are coalition members Melanie Swisher, Beth Bullock, Danielle Poe, Gibson, Gena Bates, Kim Zornes and Creed Culbreath. The coalition in turn recognized Gibson, who is president of the coalition, for leading the group for the last several years.